What follows is the Google chat transcript of a knock-down, drag-out battle between myself and the ferocious Tristan Matthews on the subject of John Green, and more specifically his very Donna Tartt-like novel Looking For Alaska. TRISTAN: How did you feel about Looking For Alaska? ME: I strongly disliked it, although many parts were charming. TRISTAN: And I strongly liked it! ME: I think the mythologized woman is not a teenage story I enjoy very much. I’ve run into tons of them — Almost Famous is a good example — and as a genre, I would say the story never gets to the point of being able to say anything about love, gender, or “the cool,” because the narrator is made so deliberately immature (with his redeeming quality being always, ALWAYS, his sweet good nature). TRISTAN: The mythologized girl is something EVERY high school guy I knew did. ME: Anyone could, if it was important to do this, write some novella about the cool sad girl who smoked cigarettes and how nobody understood her, not even them. But a lot of these interactions, including the ones in my past, were actually more banal than that — and, to me at least, that banality is ultimately more challenging and interesting than the exaggerated mythic version. TRISTAN: That’s just what I liked about the book — it did a good job asking how much you can know about other people. ME: In parts, totally. I guess I’m just saying that if you’re a really terrible fullback playing soccer, and you barely ever even touch the ball when you try to kick it, you could probably turn that into a story about the frustrations and randomness of sport. And in a small way, your story would even apply to the experiences of the greatest soccer players in the world. But it still would be a stretch, and that’s how I feel about Looking For Alaska, or Almost Famous, or 500 Days of Summer, or Murakami’s Norwegian Wood — books about running by people who have barely learned how to walk. I completely agree that guys do this; the problem is to find another way of telling the story that doesn’t bend over backwards to validate/invalidate that story and those behaviors along the same lines as has already been done a lot. TRISTAN: I don’t buy that analogy at all. First of all, I believe the story is fairly autobiographical. Something like this happened to him [Green] in high school. So like, yeah, when you write about the girl you mythologized in high school, you will mythologize her even more. But the interesting parts portrayed a band of kids, sharing a bunch of experiences, and believing in some kind of mutual trust based on not snitching. Then one of them [Alaska] does snitch, and then dies (or maybe commits suicide) all for totally unclear reasons. Suddenly it doesn’t seem like they knew her very well, and they can’t be sure, any longer, that they understand each other either. So that’s basically how I feel about the novel of adolescent romance. What all people have in common is a) not knowing each other, and b) finding romance bewildering. In that sense, a guy with no experience is no worse off than a guy with lots of experience, and not only is his story valid, but he might even tell it more honestly because he knows he doesn’t know women (especially The Woman). At the same time, we’re talking about somebody who hasn’t reached that point, described in the quote, of asking more difficult and more encompassing questions. Even when these stories are autobiographical, they’re framed by hindsight, and the question “why tell this?” remains. Suppose you woke up and saw a chat message from me announcing that yesterday I’d eaten two bananas. You type “what the hell?” and I go, “what? it’s the truth!” Well, yes, perhaps it is, but it’s still an open question what’s motivating me to tell that particular truth in that way to that audience. I think in some cases, at least — if not in all of them — what you have is a guy who has accepted much less idealistic ways of pursuing and relating to women, who then compensates for what feels like disillusionment by creating a romanticized narrative about his own awkward years. Now, this narrative may even be a fairly truthful account, but the reason it is there in the first place is either as a way of avoiding the unresolved questions of the present-day, or, worse, as a sort of justification for subsequent cynicism. You really see this in both 500 Days of Summer and Norwegian Wood, where basically the story ends with “Jesus that woman was annoying, I’m choosing somebody a little more cheerful and sane,” and yet all along, right up until the very end, the annoying woman appeared to be the focus of the story. The love triangles that develop in these sorts of groups, however, are very interesting, both in Looking for Alaska and Almost Famous. That’s one of the deeper elements of the genre, and I think you’re right to put Alaska in the context of the whole group of mostly male friends. That somewhat objectifies her, but c’est la vie. TRISTAN: Once again, I totally disagree with you. I think Green’s target audience is clearly young adults who are still busy idolizing people of the other gender, and his book does a good job of looking at that practice and the problems with it. Meanwhile, a reader like me, whose high school years are long past, gets an interesting window into the way social groups center their interactions around certain idolized figures, both Alaska and the roommate. What’s more, when a tragedy occurs, it not only reveals how little people know about each other, it also forces everyone to step back and examine their own reactions to what happened, and what that says about the real nature of their relationships to the others involved. For both of those reasons, I would say it is a story very much worth telling. ME: And for my part, I should admit that part of what’s troubling me here are actually the Amazon summaries of his other novels, which seem to suggest that he writes some version of this story over and over — for example, the ninja girl in Paper Towns seems like a more ridiculous version of Alaska. A half-baked Alaska, if you will. It’s a better story if he tells it once, and so can lay claim to a sort of instructive purposiveness (i.e. that it’s a story for people still in the middle of this particular experience) than if he returns to it obsessively because “how can I ever really know these manic pixie dream girls?” is his only way of reaching out to female characters, period. TRISTAN: Yeah, I mean, his first 3 books definitely do that. I read it slightly differently, though. 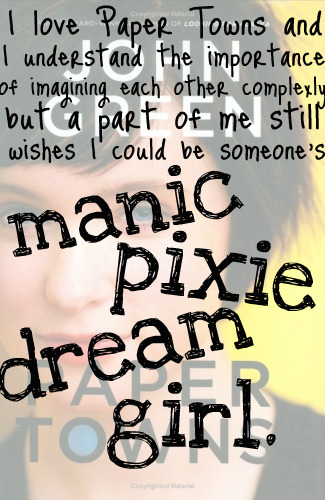 Because his main character is always perceiving himself as more geeky than he actually is — i.e., they are all kind of popular, but don’t realize it — Green uses the slightly manic pixie dream girl as the… oh, what is it called, you know: the thing in the suitcase that you’re chasing after, which is actually only there so he can tell a different story about the main character and his friends. ME: You’re thinking of a MacGuffin. Or, in this case, a Ms. Guffin. i like the part that begins “So that’s basically how I feel…” where i the reader think that you have used the chat to segue into the first-person blog post, and we settle in to read it, and then many more sentences pass, and then suddenly we are confronted with the realization that you are, in fact, ostensibly STILL CHATTING.